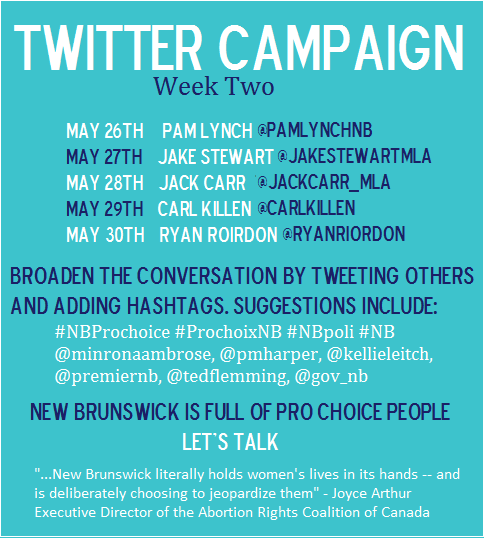 The first week of our #NBProchoice twitter campaign has come and gone and we are getting ready to begin on week two today. Hundreds of tweets were sent out to MLAs and Premier Alward. ZERO responses were sent back. ZERO. Let that sink in for a moment. These public servants openly attended an event celebrating the status quo and/or further restriction of reproductive healthcare and bodily autonomy, not to mention flat-out endorsing NB’s violation of the Canada Health Act, Charter of Rights and Freedoms, and UN human rights standards. Two months have gone by with absolutely no response from the sitting government. We send messages to them every single day through letters, emails, tweets and phone calls. We are here, we want to talk, and no one cares. This movement cannot lose steam. We need to show that we are not going anywhere, this issue is NOT going away, it WILL be an election issue, and we WILL remember every single minute of silence. Been reading that you’re crowdfunding. I want to donate; however, I haven’t been very lucky in finding out where and how. Please provide the link or website address so I can financially contribute to securing reproductive health rights for myself and for my daughter and all women in NB.